Ｌｏｖｅ... When do you think you can feel the love from fans ? 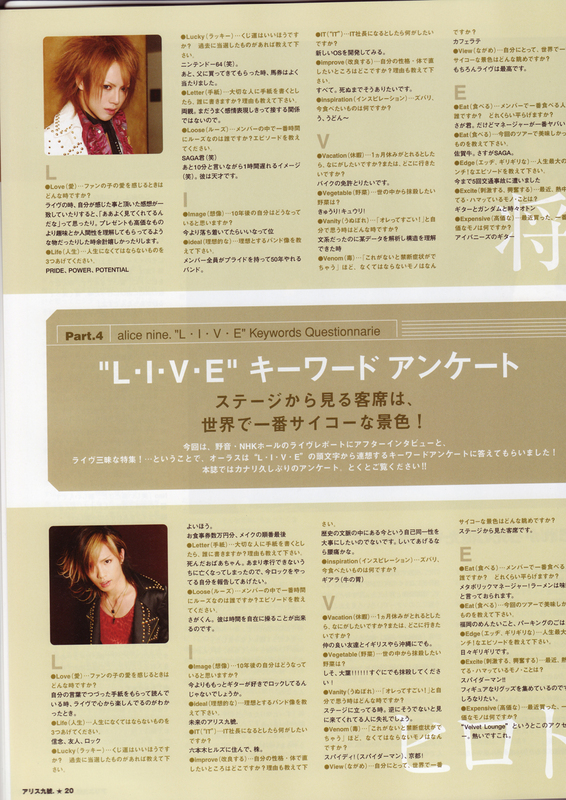 Shou : I can feel it during the live, I can feel it by receiving their impression on the live like 「It went well」. Their presents are expensive too, but I'm happy. Hiroto : When I was reading the letter, and I enjoy the moment during live too. Saga : When I see the everyone's face at live and when I read fan mail, it's countless. ·Ｌｉｆｅ... Please tell 3 things that important in life. ·Ｌｕｃｋｙ... Are you lucky person? Please tell us what prize you have won. I got it from my father, he won the money from betting ticket. ·Ｌｅｔｔｅｒ... If you could write a letter to an important person for you, which person you'd like to write to ? Please tell us including the reason. Shou : My Parents. I want to express my feeling because I don't have a connection with them now. Eventhough it's only 10 minutes, but he can be late in 1 hour (laugh). He is a genius. Hiroto : さがくん。He can manipulate time at his own will. ·Ｉｍａｇｅ（imagination）...　What do you think you'll become 10 years from now? Hiroto : Right now I'm thinking what I might be if I don't like playing rock guitar anymore. Saga : My music still good. 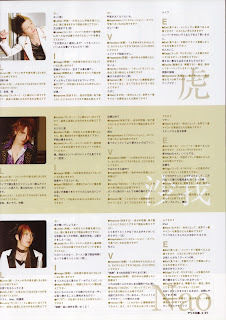 Nao : Of course everyone's affection ... odenkun ni ... !! ·ｉｄｅａｌ... Please tell us your ideal dream band. 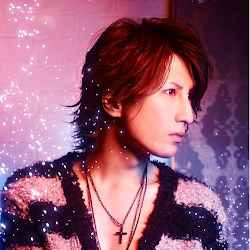 Shou : The band still have the pride for the next 50 years. Hiroto : The future of alice nine. Tora : Becoming a better band. ·ＩＴ...　What if you became an IT manager ? Shou : Developing a new OS. Nao : Buy "peach pig iron" (桃銑) thing! ·ｉｍｐｒｏｖｅ...　Would you change your body appearance? If so, please tell the reason. Shou : All. I'd like to be death. Hiroto : To make a self identity, the context inside the history is important. if you insist, it's lumbago. Tora : My wrist is fat. ·ｉｎｓｐｉｒａｔｉｏｎ...　What would you like to eat? 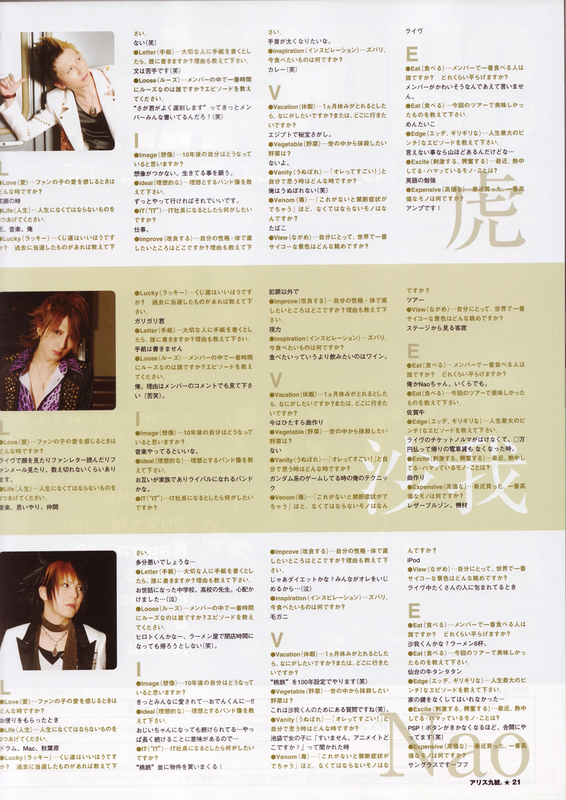 Saga : Instead of eating, I'd choose drinking wine. ·Ｖａｃａｔｉｏｎ（holiday）... If you could take a rest for 1 month, what would you do? Also, where do you want to go? Shou : I want to get motorcycle license. Hiroto : Going with good friends to somewhere in English or Okinawa. ·Ｖｅｇｅｔａｂｌｅ... Which vegetable you would like to bannish from the universe? Hiroto : It's Ooba (beefsteak plant)！！！！！！ It must be killed immediately! Tora : There isn't any. ·Ｖａｎｉｔｙ（pretension）...　「I am good！」when do you feel you're good? Hiroto : When I'm standing on stage. It's not so conversely, it's impolite too see the people (from stage), I guess. ·Ｖｅｎｏｍ...　「this can make you withdraw from the society」 What kind of thing you can't do without it? Hiroto : Spider ! (Spiderman), Kyoto! ·Ｖｉｅｗ... According to yourself, what is the best psycho scenery in the world ? Shou : Absolutelu the scenery from the live is the best. Hiroto : Scenery from the stage to the guest seating. ·Ｅａｔ... Which member likes to eat the most? How many he eats? 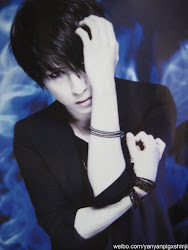 Shou : saga-kun. But manager is the worst. Hiroto : Metabolic Manager! He likes Ramen and miso siru. Tora : I don't dare to give a name. Saga : Me and Nao-chan. As much as we like. Nao : Is it Saga-kun? 6 cups of Ramen. ·Ｅａｔ... Please tell us the best food during your live right now. Shou : Sagagyu* (佐賀牛). good SAGA. Saga : Live ticket, I paid for about 10000 yen, and I don't have any money left for train fare. ·Ｅｘｃｉｔｅ... Lately, what do you devote? I collect spiderman goods. I want to be better at it. ·Ｅｘｐｅｎｓｉｖｅ...　Last thing you bought, what's the most expensive one? Hiroto : ”Ｖｅｌｖｅｔ　Ｌｏｕｎｇｅ” accessory. That's hot.